The Duke of York's Theatre opened as The Trafalgar Square in 1892 and changed its name in 1895 to The Duke of York's theatre in honour of the future King George V.
Previous productions at The Duke of York’s include Richard O'Brien’s The Rocky Horror Show, Olivier Award-winning performance The Weir and Ronald Harwood’s The Dresser. 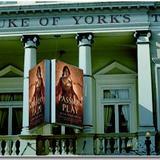 Do you work at Duke of York's Theatre? 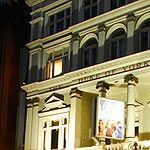 What did you think of Duke of York's Theatre? Me love David Walliams long time! Reckon he'll be excellent up on stage - good luck to Michael Gambon! PT2 What is the world coming to when youre not allowed to go to the toilet? What is the world coming to when you pay for something and then do not receive it? Surely there is some kind of law against not providing a product, service, form of entertainment which has been paid for?